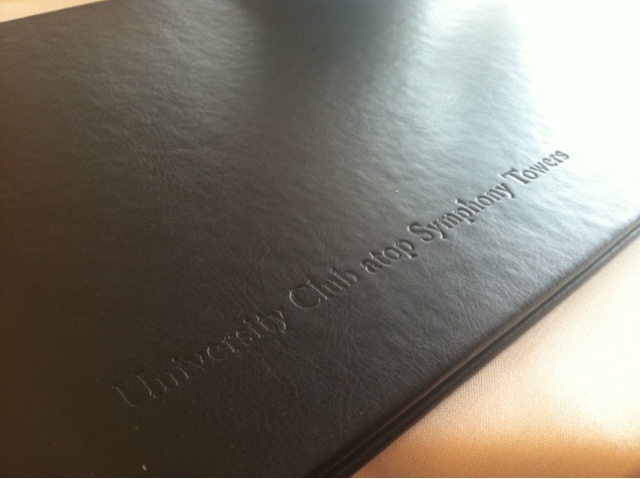 The hubby and I were fortunate (and really ecstatic) to receive another invitation to visit the University Club atop Symphony Towers to celebrate six years of wedding bliss. The last time we visited for our 4th anniversary dinner, they were undergoing renovations and in the process of expanding their space so it was great to see that they modernized the club, by adding more color. The very first time we visited, my organization just got a membership to "San Diego's premiere private social and private club" and I was super duper excited to go. Unfortunately, we did not have the chance to explore and take photos (no private tour this time) so hopefully the next time we visit, we'll be able to! We were right on time for our reservation so they took us down the hall immediately to one of the main dining rooms, with, of course, a breathtaking view of the city. We went for lunch and sat amongst business people, we could tell. A lot of wining and dining, corporate conversation were around us.... and there's us, two people celebrating love (and talking fantasy football strategies... yeah, seriously). OK, food time. 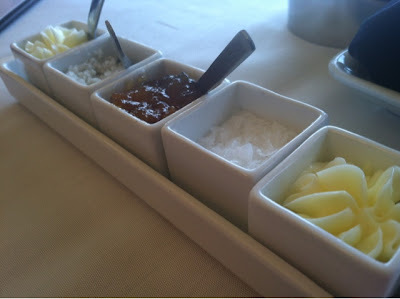 The crunchy bread was served with soft butter and an orange infused marmalade. The cute little ceramic squares were also filled with salts from France. 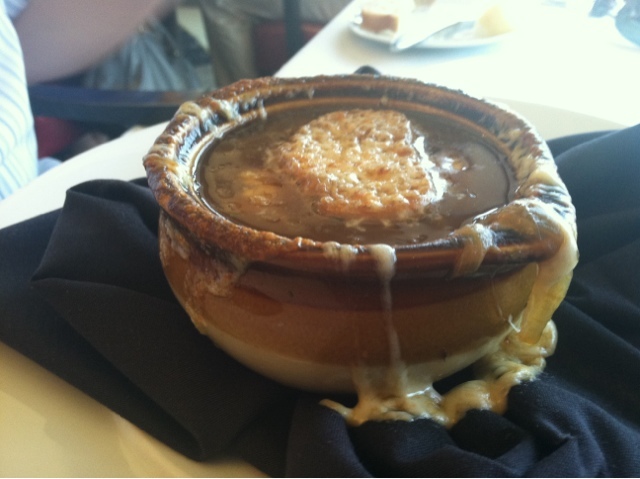 The hubby started out with a crock of sweet onion soup ($6.25). Mmm, this soup is always a favorite for the both of us. Sweet, caramelized onions, beef broth, toasted baguette croutons and, non-traditional, melted provolone cheese were the ingredients for the Club's version. My steak was definitely overcooked, but... I was hungry and, seriously, I was okay with it. 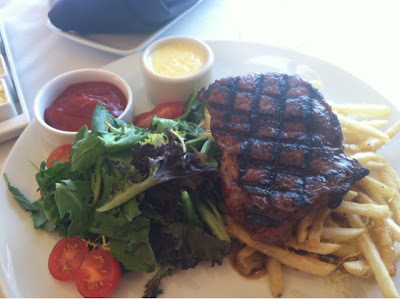 The steak had a nice charbroiled flavor, the frites were cheesy from the asiago and crispy, and the Bearnaise sauce was on point. Even the greens were dressed nicely in a tangy vinaigrette. Everything was yummy. Our server checked up on us after more than a few bites of our meals. 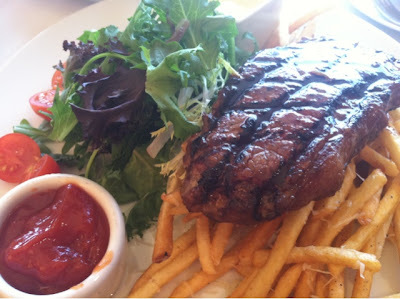 Him (to me): "Your steak looks a bit over." Me: "It is, but it's really okay." He quickly took my plate and returned it to the kitchen. Ten minutes later, I have a whole *new* dish, with a perfectly cooked steak, which unfortunately, I did not finish. In fact, it looked like I barely touched it because I already ate a good portion of my first steak dish. Still, I appreciated that the server insisted to return the dish. The hubby ordered the almond crusted halibut ($20.00). 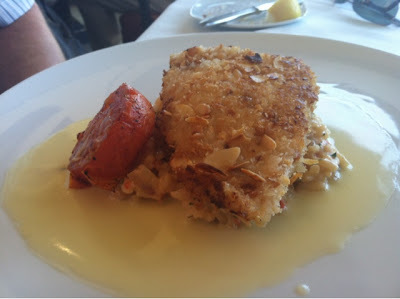 His dish came with rock shrimp risotto, charred tomato, and a citrus butter sauce to tie everything all together. It was rich and so delicious. We just had to get a dessert to share for our anniversary. 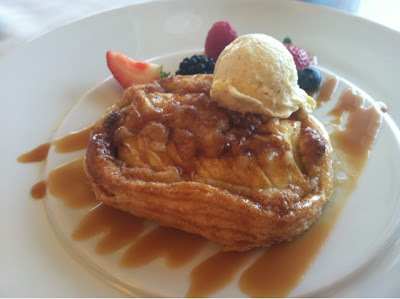 We ordered the apple tart ($9.00) with vanilla bean ice cream, fresh berries, and a caramel sauce. 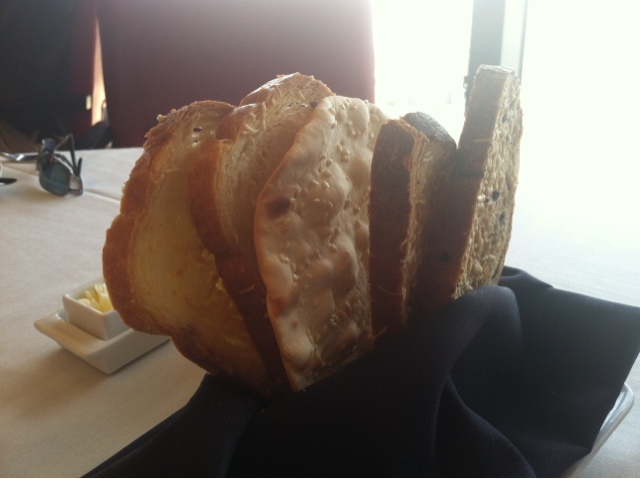 It was warm, sweet, buttery and a perfect end to our anniversary. The University Club really is a real treat for us. We are lucky to have visited and dined amongst business executives. 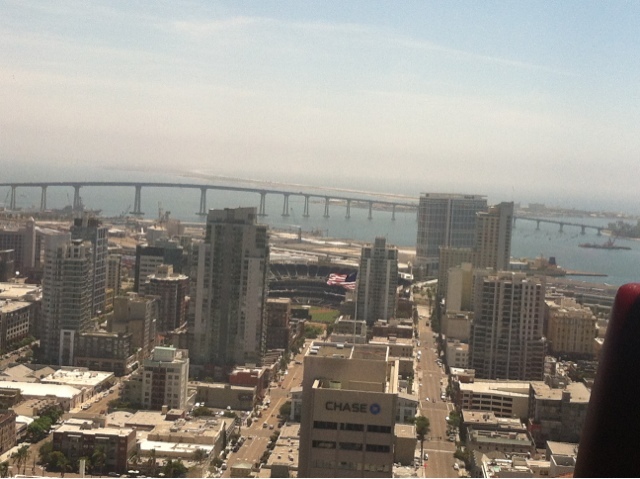 The service is great, there is a guy who plays the grand piano while we ate, and the view.... wow, I cannot get enough of the view on the 34th floor of Symphony Towers, overlooking the Coronado Bridge, Point Loma, and Downtown San Diego. Happy Anniversary to you both! That's nice that the server took back your steak and insisted it be redone - a mark of good service! The view looks outstanding as well. A great treat for your anniversary! Happy anniversary ! I came here YEARS ago and thought the food was 'ok' BUT the views were amazing. Is it still membership only - is there a way to try out the restaurant if you don't have membership? Hi Faye! Thanks! :) Yes, it's still membership only. I had to get a voucher from a member and submit it upon check-in at the front. That's too bad that the food was just okay when you tried it out! Thanks for stopping by!